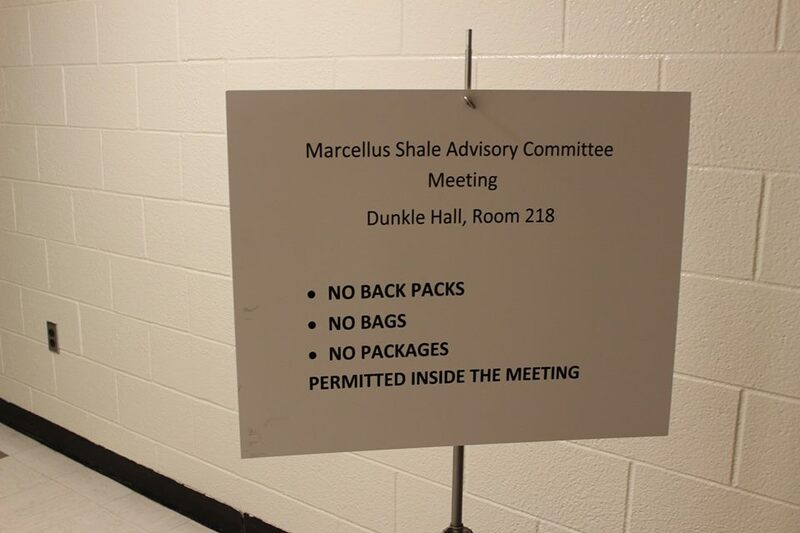 A new sign outside the state’s monthly Marcellus shale advisory commission meeting. //photo by Savage Mountain Earth First! As Maryland closes in on a decision whether to allow fracking, two key studies — on economic and health effects — are in play. One doesn’t deliver on its main mission. The other has huge gaps, not of its own making but because the science it relied on is incomplete. So, if the process works, the Marcellus Shale Safe Drilling Initiative Advisory Commission and the Maryland Departments of the Environment (MDE) and Natural Resources (DNR) should at the very least, with these studies in mind, tell Gov. Martin O’Malley that they don’t have the information necessary to decide whether fracking poses unacceptable risks to the state’s residents. That’s what the governor, in his 2011 executive order, said he wanted to know. The biggest trouble with Maryland’s $150,000 economic study of fracking was what was missing: the effect on tourism. A few years of boom followed by a bust will ensue, the report said. But we suspected that before we even took a peek. Western Maryland will get some jobs and tax revenue. We knew that in advance, too. All that is documented with rows of numbers and dollar signs. What everyone wanted to know was whether fracking would harm tourism, the main economic engine in Western Maryland, and, if so, by how much? We still don’t know. Dr. Daraius Irani and his Towson University team’s economic report on fracking in Western Maryland took such a pummeling at the commission meeting Monday at Frostburg University that one observer remarked that he was beginning to feel sorry for the economist. In addition, an economist living in Garrett County is already on record asking for his taxpayer money back. “I knew our report would be disliked by both sides of the argument,” Irani said, as if that were the problem. It’s not. He said the team was unable to get sufficient data on drilling’s effect on tourism. He mentioned, however, one Utah study indicating that tourism and extractive industry could coexist with sufficient geographic separation. “If you have extractive industry, you probably wouldn’t want to put them next to your natural wonders,” he said. How large of a separation? He didn’t know. The report found that property values within a half-mile of drilling would decline 7 to 9 percent, a falloff that would continue for years after drilling had ended. Turns out, though, that this estimate is based on data from conventional gas wells, which don’t produce nearly the disruption that comes with fracking. The report also failed to examine costs from accidents or well-water contamination. (Costs to community health and emergency systems weren’t part of the study scope — or any of the state’s study scopes, for that matter.) The report also couldn’t say how many local residents would get the boom-year jobs, although Irani said he would try to include an estimate in the rewritten report. Curious language indicates that “tourism-related businesses (hotels, restaurants, retail, etc.) 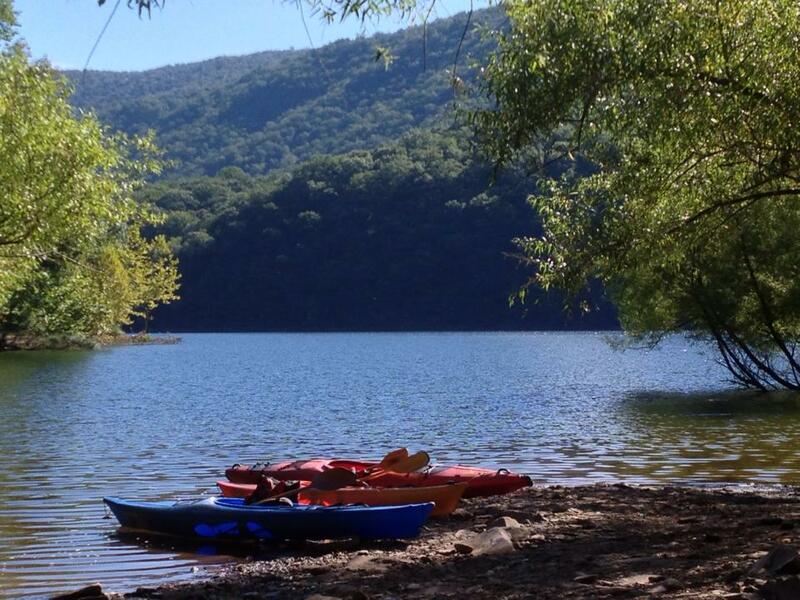 can provide the amenities needed by shale drilling workers.” Leaving us to imagine drillers relaxing at B&B’s and taking a kayak ecotour in their off time. Overall, Irani said, the report doesn’t recommend whether to allow fracking. “This is an opportunity for the counties to make decisions about whether they want to pursue this or not,” he said. “I heard you just now recommend….that the counties need to look closely at the options and weigh the pros and cons. That’s what we get for $150,000?” said Paul Roberts, a farmer and winery owner who is the citizen representative on the commission. “We failed to get at a central issue in this debate,” said Roberts, who also said he would would be writing the governor to ask for money for another study. “We don’t have the answers to so many things that could cost this region so much money,” Commissioner Ann Bristow said. Many in the audience also expressed grave disappointment with the report. “It’s extremely self-evident that the linkage of tourism and property values … is the elephant in the room,” said Paul Durham of the Garrett County Board of Realtors. “We have to study it and report out on it before making any decisions.” The Board of Realtors also issued a press release days before the meeting saying it opposed fracking in the Deep Creek Lake Watershed because of research indicating a 22 percent loss in property values in drilling areas. “Unfortunately, a lot of the unknowns have to do with risk … and more of the knowns have to do with benefits,” said John Quilty, also a member of the county’s shale advisory committee. 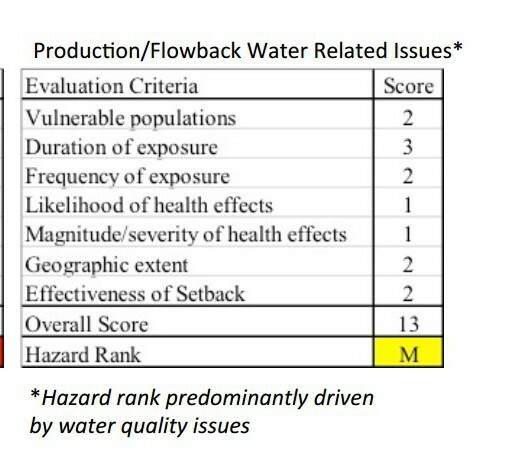 Worth noting is that the scorecards for water contamination and cumulative risks — with hazards ranked as “moderately high” — would have been in the “high” risk, red zone with an extra point or two. 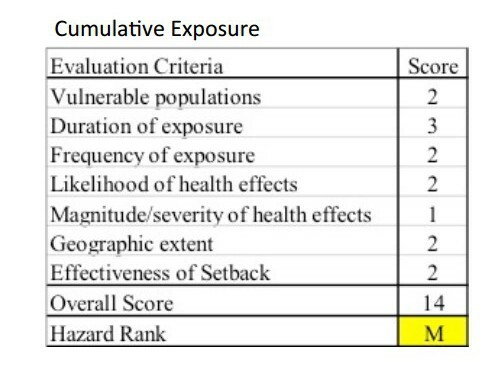 And they got just one point in several categories only because the study team couldn’t determine the risk: “[E]vidence regarding the magnitude/severity of health effect could not be determined because of insufficient data.” Without more data, these categories, with their promise of “moderately” high risk, offer a bit of comfort where none might be warranted. 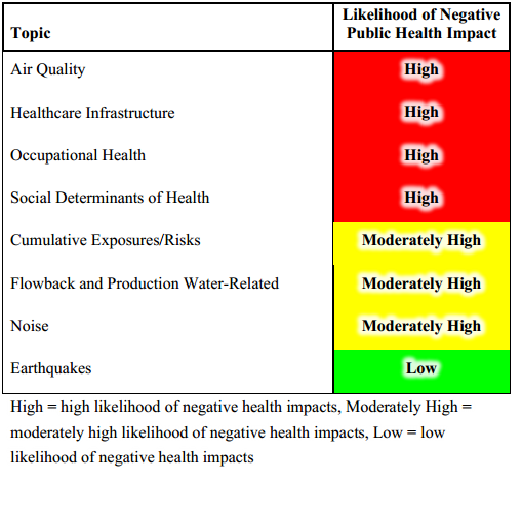 Other recommendations include: starting a birth outcomes surveillance system (to watch for birth defects, stillbirths and low birth weights found in some studies); start a study of dermal, mucosal and respiratory irritation (reports are numerous of residents complaining of rashes, nosebleeds and asthma in drilling areas); develop a funding mechanism for public health studies; require air, water and soil monitoring to protect the community and workers; assess whether standard setbacks are sufficient; require monitoring of leaking methane, a powerful greenhouse gas; and train emergency and medical personnel to be able to care for the industry workers. “There are a lot of unfunded mandates here,” Bristow said. And many unknowns, acknowledged in a section called Limitations. The industry is new, the science is limited, money is short, and some illnesses might not show up for years. “So, perhaps we will continue the experiment here,” Commissioner Nick Weber muttered. Would the recommendations mitigate adverse impacts, taking a high to a medium, Commissioner Harry Weiss asked. “It doesn’t say you can lower a score by 10 points if you adopt this recommendation,” said Mitchell, who outlined the report but deferred many questions until next month’s meeting, when the study team would be present. The recommendations would only bring some improvement and help prepare Maryland, he said. Guards checked bags. A Frostburg student’s hoisting of a jug of brown water during last month’s meeting triggered the heightened concern for security and safety. Later, Mitchell advised commissioners to move to seats in the audience so as not to strain their shoulders while turning to view his PowerPoint slides. 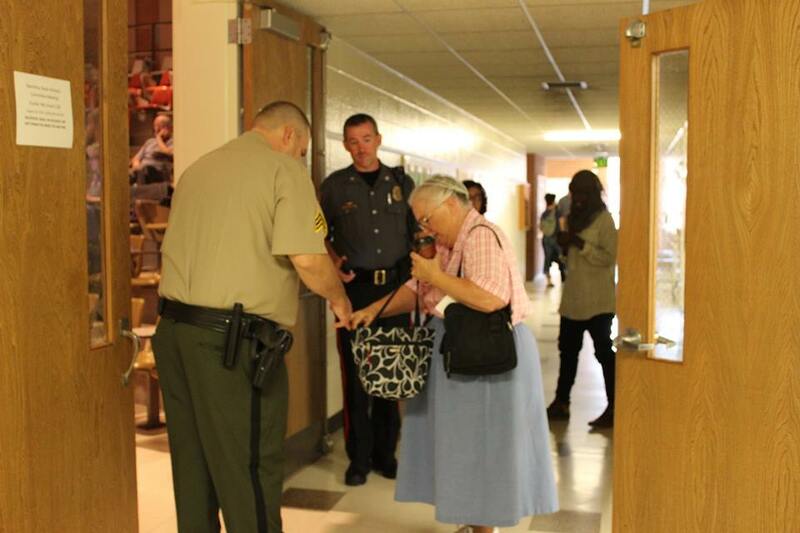 Security guards check bags outside the monthly shale advisory committee meeting.//photo by Savage Mountain Earth First! If we are concerned about backpacks and ergonomics, we should be on high alert about contaminated air and water; climate-changing methane; trucks chewing up and crashing on narrow, winding roads; babies born too small or with birth defects; asthma; skin rashes; falling property values; loss of peace and quiet; unmeasured threats to tourism and food businesses built on healthy forests, rivers and farmland; and an energy future built on fracked gas, snaking pipelines and compressor stations dotting the landscape. Maryland’s western counties are worried about revenue gaps, closing schools, and young people moving away, but grasping at fracking seems the most unimaginative and dangerous of solutions. As both these reports show, too much about fracking is unknown. Much of what we do know isn’t good. The governor’s executive order creates a false deadline. Instead of rushing to meet it, the commission and state departments should acknowledge what they don’t know. And ask for more time for the research to unfold.